a person who uses the system not for a hand up but for a hand out, they live on the system and seem to be quite content with doing so. The term bunny comes from the fact that they usually multiply as such and have many baby daddys, thus securing their ability to receive assistance. Wait a minute...? Huh?! By now you are probably very confused. What the heck is she talking about? Welfare bunnies waste their money on drugs and alcohol- not on the items listed above. They get way too much money, but not that much money. I'm guessing that when you read the definition of a "welfare bunny" you were probably picturing a poor single mother- a.k.a-. 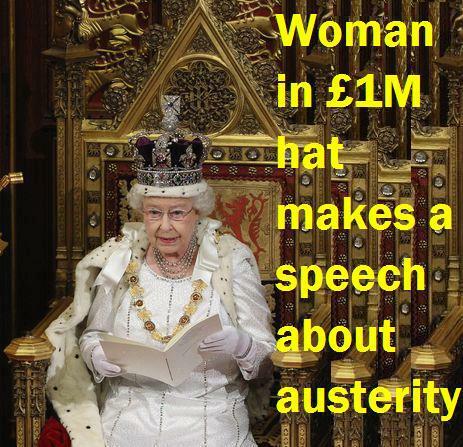 a "welfare queen". Well, this was not who I was picturing. I was picturing a certain queen- not just the kind with quotation marks- but also the literal kind. Her name is Elizabeth II. I'm sure you've heard of her. She is a queen and a "queen"... and the queen of all welfare bunnies . It baffles me that conservatives and other Scrooge McDicks have been so successful in convincing people that they should begrudge the tiny amount of welfare money the state spends on poor single mothers and their children. And it is a very tiny amount. As the DWP’s 2011 Report on Households Below Average Income reveals those on social assistance are hardly livin’ it up. In fact, I don't know how they manage to live at all. Yet, these same Scrooge McDicks have absolutely no problem with the British royal family who live obscenely luxurious lifestyles all at the expense of the public purse. Conservatives and other Scrooge McDicks are also probably the reason the picture of a poor single mother and her children- not a queen and her rich royal family- first comes to mind when we hear the term, “welfare bunny”. That isn’t fair and it needs to change. No one more than Elizabeth II and her prodigy of bunnies deserves this title. So, dear reader, let the conditioning of your mind begin. The process will be broken down into two parts: the welfare part and the bunny part. I decided to begin with the welfare part because it's the easiest. We already know that the royal family receives their money from the state, but how much do they get exactly? The official number is £38.3 million per year. However, this number leaves out some important items, such as security, travel expenses, and lost revenue from the Duchies of Lancaster and Cornwall. 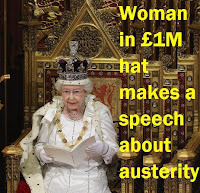 When these expenditures are taken into account, the cost to maintain the royal family is estimated at £202.4 million per year! It's hard to believe, isn't it? Well, some people don't believe it. Some people think the cost may be even higher given the lack of transparency and shady dealings surrounding the finances of the royal family. But even if the cost is (insert sarcastic tone) as low as £38.3 million the fact that one family, let me repeat, one family receives £38.3 million a year from the hard-working people of Britain for having done absofuckinglutely nothing at all is outrageous. Yes, I know. Unfortunately I am going to have to defend my last statement in the previous section because, believe it or not, some people actually argue that the royal family deserves the money they receive from taxpayers. Apparently, they have earned it and continue to do so. Hmmm...I suppose if you consider killing members of your own family, executing millions of your fellow citizens, stealing land and resources from the inhabitants of other nations and executing them too, to be legitimate ways to earn money and power, then I guess the royal family has earned the position they hold today. Ok. I know what's coming next. Some will argue that you cannot hold these individuals responsible for what their ancestors did. Maybe not, but the fact is, the wealth, power and title that they hold today is the result of these crimes of the past. And what about all the work the royal family does today? Can't you see the sweat on the queen's brow that is the result of a long, hard and laborious day of smiling and hand-waving? Travelling all around the world and hosting lavish ceremonies and parties for other rich and famous people can also be quite exhausting. Especially when you pay other people to do all the work and preparations for you. 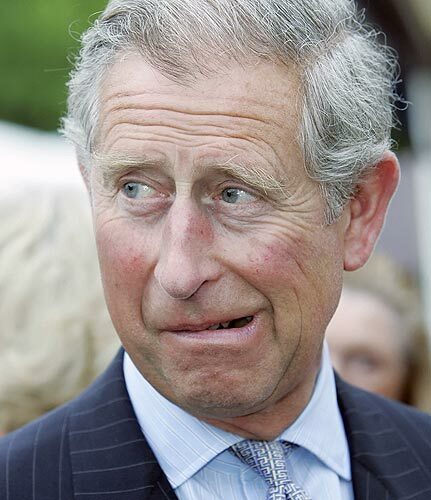 Mark Bolland, former press officer for Prince Charles, was quoted on Janet Street Porter's BBC programme in 2005 as saying "the Windsors are very good at working three days a week, five months of a year and making it look as though they work hard." Another argument made by monarchists that I must address is the money the royal family supposedly bring in via tourism. There are some who will argue that the royal family attracts tourists and if Britain got rid of them the country would lose money. This argument is easy to refute. In reality, of the top twenty tourists attractions in the UK, only one of them is a royal residence. That's right . One in twenty. Not really good odds and very unconvincing. To hear other unconvincing arguments and their rebuttals, watch the following video. It includes a perfect summary of why we should not be amused with the system of monarchy. Okay, so cute is not a common characteristic shared by bunnies and royals. What about softness and cuddliness? No and no. What about lustiness? Perhaps. Prince Harry's actions of late would most certainly make his ancestor, King Henry, very proud. For all her preaching about chastity, Queen Victoria was closing her eyes and thinking of England so much that she had nine children. And although Queen Elizabeth II had less than half the amount, she still fulfilled the most important duty a woman in the royal family has: to have children. From the day she married, Princess Kate has been under pressure to start a family. It's been a year now, and people are starting to talk! Princess Diana had her first child only eleven months after her wedding day- and take another look at what she had to do in order to accomplish this task! Kate needs to get busy. 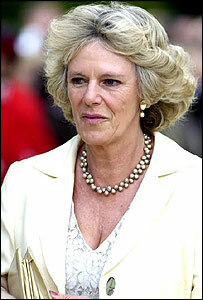 The royal family requires those bunnies to keep that £202 million welfare cheque a-coming! By the way, don't you just love how the royal family helps to preserve outdated roles for women. It's like the women's movement never happened! Their existence also helps to preserve outdated systems of governance- i.e. monarchy. It's like democracy never happened! Well, while it can be argued that true democracy does not really exist in Britain (or even in most places in the world), its seeds have been planted and there are some signs of growth. This is where I make my next comparison of bunnies to the royal family. 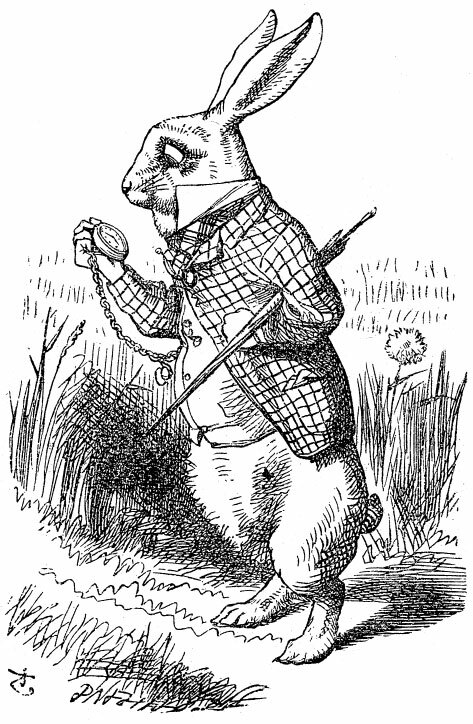 So far, we've looked at the more benign characteristics of bunnies, but let us not forget the tale of Peter Rabbit. Despite that the reader is supposed to sympathize with Peter, we cannot ignore that fact that the little bugger is a thief! There is a reason Beatrix Potter chose a rabbit to tell her story. Rabbits are notorious for stealing food from farmers' gardens- just ask my grandmother. Do you know who else engages in thievery as though it is part of their nature? Ding, ding, ding!You guessed it- the British royal family. And no, I don't just mean that they are thieves because of their past crimes I mentioned earlier or just because they take hard earned money from working-class people via taxes, but because their very existence steals from a truly democratic system of governance our society is trying so hard to grow and foster. The lay people are farmers of democracy, if you will, and the royal family is Peter Rabbit. Sorry, Beatrix, but even though I was never meant to, I've always sided with Farmer McGregor in your story. 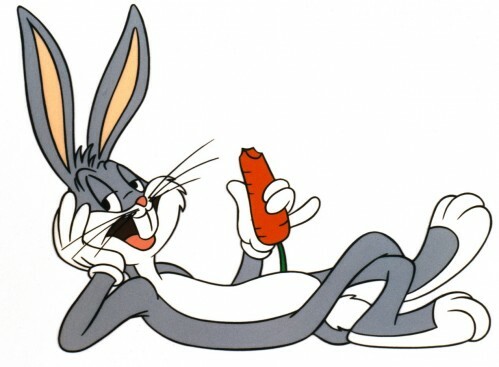 Another infamous thief and trickster in the form of rabbit is Bugs Bunny.Yes, I know, he is supposed to be another character whose side the audience are supposed to be on whilst watching his cartoons. However, I find him, looking back as an adult, to be a complete and utter a*hole. He is a pompous, lazy, selfish, gluttonous twit. Therefore, even though I don't entirely sympathize with his nemesis, Elmer Fudd, I will take his side for the purposes of creating an analogy between the interaction of these two characters and the interaction between the British monarchy and its subjects. Basically, they are Bugs Bunny and we are Elmer Fudd. Our natural instinct should be to *hunt and *kill pesky, pompous, lazy, selfish, gluttonous wabbits because their "meat" (a.k.a. their wealth) would provide us with the sustenance we need for creating a fairer, more equitable society. But somehow they manage, as Bugs always does, to distract us from achieving our goal. Once we are utterly tricked and fooled into acquiescence, these wabbits run off with the entire bushel of carrots. Queen Elizabeth's Diamond Jubilee is my case in point. 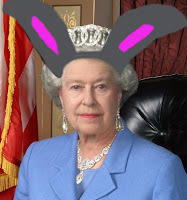 During a time when we are facing one of the worst economic crises in history, the Queen and her prodigy of bunnies are parading around in a spectacle of obscene wealth (I cannot give actual numbers as they have been conveniently unreported.) while children in the country are going to school hungry. What's up with that, doc? Okay. I could go on and on (and on) about how much I despise the monarchy, but I think my attempt to alter your mind has been accomplished. 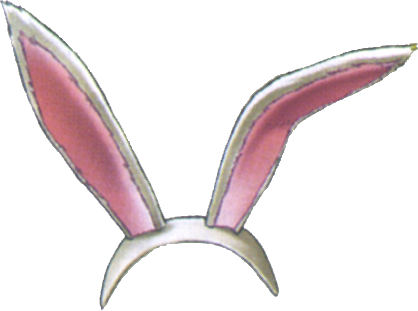 I am pretty sure that the next time you hear the word "bunny" you will think of a heck of a lot more than Easter and carrots. I must also end this post now as I am late... for a very important date. Ha ha. But in all seriousness, I hope that what you've read here today, dear reader, will help you to climb back up the rabbit hole, escape from the nonsense and absurdity that is perpetuated by the monarchy and its supporters, and inspire you to speak out against those who oppose the creation of a world in which logical and rational arguments prevail. WARNING: Don't follow the bunny! *As a vegetarian I do not really advocate for the hunting and killing of any living creature. I am simply using these terms for the purpose of making an analogy.